Do you have a common last name whose origin you have always wondered about, such as Lewis, Adams, or Bass? Did you ever wonder if you were related to a famous person with the same surname? A helpful research tip to figure this out is to search for information regarding the first ancestor that you can find in America, and then attempt to find common ancestral lines. 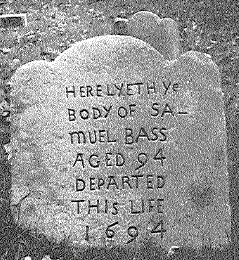 Using Bass as an example, two of the first settlers of the Massachusetts Bay Colony were Samuel Bass and his wife, Ann Saville, who came to Roxbury, Massachusetts, circa 1630. Their names have been found in church records in Roxbury and also in Braintree, Massachusetts. Samuel Bass eventually became a deacon, and their gravestones are still intact within Hancock Cemetery in Quincy, Massachusetts. Research into the Bass family reveals that there was a man named Perkins Bass, a son of Joel Bass and Cathleen Wright Burnham, and a descendant of Samuel and Ann (Saville) Bass. Perkins Bass was born on 30 April 1827 in Williamsburg, Vermont, raised on a farm, and graduated from Dartmouth College in 1852. He studied law and began practicing in Chicago. Perkins was actively involved in the Chicago educational community, and the Perkins Bass Elementary School in Chicago is still a fixture there. He was a good friend of Abraham Lincoln, for whom he campaigned, and after Lincoln’s election in 1860, Perkins Bass was appointed United States District Attorney for Northern Illinois. He went on to have a son, named Robert Perkins Bass, who became the 62nd Governor of New Hampshire and a member of the New Hampshire House of Representatives. Another famous Bass family member who traces their ancestry back to Samuel and Ann Bass was George Henry Bass, born in Wilton, Maine on 22 July 1843, a son of Seth Bass and Nancy Russell. George Henry, or “G.H.” to his friends, founded the Bass Shoe Company in 1876, eventually calling it G.H. Bass and Company. He began with six employees, and the machines were run by hand and foot power. By the time of G.H. Bass’s death in 1925, his company was creating 900 pairs of shoes per day, had 160 employees in the factory in Wilton, and was selling shoes all over the world. Sometimes your ancestry can reveal fascinating information concerning people that you did not know you were related to, such as a governor whose father was a friend of Abraham Lincoln, or the founder of a famous shoe company. A helpful research hint is to find the earliest possible ancestor with that surname, and search for common ancestral lines. You never know what interesting information this tactic can reveal! American Genealogical Research Institute, Bass Family History (Washington, D.C.: Heritage Press, Inc., 1978), p. 71. Bass, Lizzie E., Jeriah Bass and His Descendants (Augusta, Me. : Kennebec Journal, 1962), p. 120. Samuel and Ann’s son John married Ruth Alden. Their daughter Hannah Bass is the grandmother and great-grandmother of John Adams and John Quincy Adams respectively. Yes indeed Ms Cusson. – Vita Brevis blogger Alicia Crane Williams can vouch for that I’m certain. She & I are both descendants of John & Ruth (Alden) Bass.. Thanks so much for posting this information about the Bass family. Having learned a few years ago that I, too, was a direct descendant of Ruth (Alden) Bass and her husband (what’s his name [horrors! ]), and thrilled to apply to both Mayflower and Alden Kindred for that line, I got my well-deserved comeuppance here about the importance of Ruth’s husband John Bass and his own family’s role in early American history. Mea culpa, but it is never too late to learn more about any ancestor, as I now intend to do with John Bass. I am descended from Samuel and Ann Saville Bass through their daughter Sarah who married Deacon John Stone. We recently visited the town of Saffron Walden, Essex, England – lovely town. I always look forward to the next Vita Brevis. I was quite taken by the gravestones and their engraving. They are sweet in their aspect and similarity. It is interesting that the engraver used “the” on Ann’s stone, and “ye” on Samuel’s. I wonder why? Perhaps the process of language change. The date on Ann’s stone is 1693, only one year before Samuel. Annie, Stratto, the “Y” in ye is actually the now extinct letter thorn (if memory serves), sort of short hand for “th”, so both would have been pronounced as “the”. Spelling was quite variable back then! 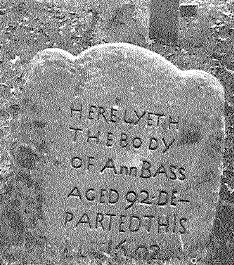 My great grandmother was a Bass, descended from the Bass family that settled in Jamestown. I wonder if there is an “old world” connection between the Massachusetts and Virginia Bass families? Yes there most definitely is! Posy, can you tell me more about the connection between the Massachusetts and Virginia Bass families? My husband and I are a DNA match at about 6.5 and we have about three family names in common in early times, one of which is Bass. I’ve not been able to locate the connection. I can’t do it now but I will photograph the pertinent pages in our genealogy for you. If you don’t hear from me please remind me. Did you do 23and me? No, I used FTDNA and then Ancestry (to receive more matches). My email addy is kayhaworth@earthlink.net. Thanks! This book is available at archive.org and was later updated. My search of the 1909 version only yielded this one reference to Bass. Thanks, I’ll keep this article as I descend from Samuel and Anne through daughter Sarah and John Stone. Daughter Mary married as 2nd, John Capen my 8th g grandfather, John married an aunt to me Ruth Alden. So, like many others I have some connections to this family. So happy to come across this article about Samuel Bass. I, too, am guilty of focusing too much on my Mayflower “Ruth (Alden) Bass” side of the family, who married Samuel’s son John Bass, to the neglect of learning more about the Bass family. As a follow-up, I have now read about Samuel Bass in one of Robert Charles Anderson’s articles in his Great Migration series. Bravo to all of you at NEHGS!